AP Oil International Limited, formerly known as Huan Chew Oil Trading Pte Ltd, was incorporated in 1975 as a lubricant distributor. We ventured into manufacturing in 1981 and set up the first Singaporean-owned lubricant plant in the Republic. A milestone was reached in 1988 with the establishment of our second lube plant, Alpha Pacific Petroleum (S) Pte Ltd. 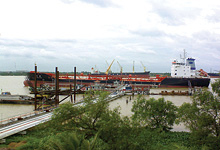 This wholly-owned subsidiary has a private jetty capable of berthing vessels of up to 3,000 metric tonnes and a storage terminal with a total capacity of about 6,000 metric tonnes. We acquired A.I.M Chemical Industries Pte Ltd in 2000 to expand our business into specialty chemicals. 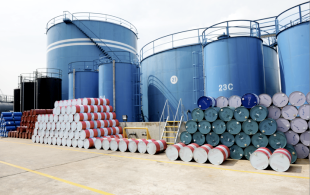 This wholly-owned subsidiary operates a chemical blending plant providing toll-blending and contract manufacturing services mainly for multi-national companies. AP Oil was listed on the Singapore Stock Exchange in 2001 and upgraded to mainboard in 2003. Our Group is principally engaged in business of lubricants and specialty chemicals. We operate 6 manufacturing plants, 3 for the manufacturing of lubricants and 2 for specialty chemicals. 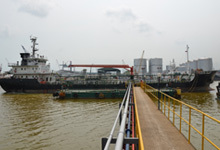 Two of our lubricants plants are equipped with terminals and a private jetty. Our products are marketed in some 20 countries and regions namely Singapore, Indonesia, Malaysia, Thailand, Vietnam, Myanmar, Cambodia, The Philippines, Bangladesh, Nepal, China, Taiwan, Hong Kong, Japan, Fiji and middle east countries, etc.